Still, American police are particularly violent. In 2015, an article in the Guardian stunned many with its side-by-side comparisons of police violence in America relative to other countries. Iceland had one fatal police shooting in seventy-one years; Stockton, California had three in six months. Australia had ninety-four fatal police shootings between 1992 and 2011; the US had ninety-seven in March 2015. And the numbers have not improved since then. When adjusted for population, American police killed over two hundred times more people than UK police did in 2018. In Germany, where police are far more violent than in the UK, police killed twenty-seven times fewer people than their American counterparts. Five states — Texas, North Carolina, Virginia, New Jersey, and Illinois — now mandate some form of instruction on how to interact with police, either as part of the civics curriculum or drivers education. Four states — Missouri, Rhode Island, Mississippi, and West Virginia — are currently considering similar measures. Many school districts also now use informal instructional programs organized and run by police, public defenders, church groups, the ACLU, or other community organizations. These programs are often pitched as a stopgap — a concrete way to equip young people with life-saving tools in a country where racism is intractable and structural reforms are elusive. Yet there is a deep cynicism at work when police violence is treated as a fact of contemporary life that can only be mitigated through a series of subservient rituals. In fact, rather than fostering a less violent present and future, the programs end up shifting the onus for avoiding deadly interactions from police onto the very civilians they brutalize. The realities of modern policing are nowhere to be found in the various policing curricula used by states and localities. In an instructional video that high school students in Texas are now mandated to watch, police officers are portrayed as a strikingly diverse group of men and women — a stark contrast to the state’s overwhelmingly white and male police force. The constant threat of violence, though unmentioned, hangs in the air. Police are understood as forces of nature, figures whose behavior can be slightly modified at best. Among the “Don’ts” listed by Strategies for Youth in their presentation “Be SMART with Police” are items like “Don’t keep your hands in your pocket — take them out slowly,” “Don’t make quick movements,” and “Don’t question or mock an officer’s authority.” If you feel you were mistreated, do not bring it up to the officer — instead, file a complaint with the department later. There’s a startling transference of responsibility here from the adult who is ostensibly trained for the encounter — the police officer — to the teenager. The burden of restraint is not on the officer, the one with lethal force — that is the business of the child. It is the very definition of blaming the victim. This inverts the actual danger present in any encounter with police. In 2017, the last year in which we have statistics, police killed 987 people; police deaths caused by another person stood at forty-six. Police are twenty-one times more likely to kill civilians than the other way around. Some students know a self-serving lesson when they see one. 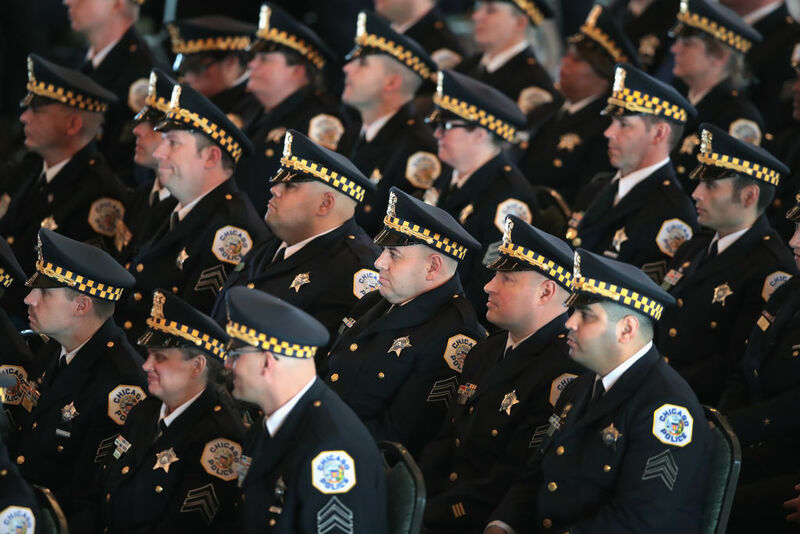 NOBLE runs a similar program in Chicago, where the history of police violence creates a particularly fraught environment for pro-police lecturing. Students here do not need to point to the ACLU reports documenting racism in police stops, or the fact that the vast majority of police stops in the city do not lead to arrest, or that in half the stops the ACLU reviewed police either gave an unlawful justification or no reason at all. They can simply draw on their own experience. Presenters for NOBLE acknowledged that their department has “bad apples” and gave students the canned response for what to do when faced with an abusive police officer: “Cooperate at the time and file a misconduct report later.” They declined to mention that 89 percent to 96 percent of police misconduct reports in Chicago are dismissed. This is sound legal advice, but in places like Chicago — where NOBLE advises students, “Most of the time, you should answer the questions. Because if you don’t, you’re making something that could have been two questions worse” — the hard realities of American policing inevitably intrude. This, after all, is the city where police commander John Burge ran a torture program on Chicago’s predominately black South Side from 1972 to 1991. His program did not simply mete out beatings, but also designed torture instruments — most notably a device that sent out electroshocks when applied to the testicles — for the police to extract (often false) confessions. In 2015, the Guardian revealed that Chicago police operated a black site where seven thousand people were “disappeared” for off-the-books interrogations. Cell Blocks for Killer Cops?